We meticulously collect every detail about every piece of climbing gear so you can see it all. Awards are given out for all sorts of reasons. Sometimes the gear is put through the wringer and only the most durable gear wins. Other awards celebrate gear for being fast and light. And some awards are given to untested gear that has been deemed truly innovative. We capture all the different awards, so you can see the full picture. With every technical spec possible, you’re able to comprehensively compare every detail about every piece of gear even if the manufacturer doesn’t make all of the specs public elsewhere - something that has never been possible before. And with all of this data you also get the most advanced filters ever seen for climbing gear, so you can narrow down on the things that actually matter to you. We collect all the best gear videos about each product to make sure you’re getting the most up to date information and reviews. WeighMyRack shoots our own gear videos. And so do the manufacturers, gear bloggers, TV channels, and other gear nerds. We believe the more perspectives you get the more informed your gear choices will be. You can get a good idea of how gear will perform from specs, but hands-on reviews can make the difference between uncertainty and confidence. We’re upping the ante with a 6 star rating system. 6 means that you can differentiate the great gear from the absolute best gear. From bloggers to major magazines, we collect all of the reviews written by print and online climbing media outlets so you don’t have to spend your time chasing your curiousity around the interwebs. We have it all right here for you. By utilizing 1.8mm R2 rand rubber, the Arch Flex system gives Mad Rock shoes an unbelievably comfortable and glove-like fit. The elastic property in our R2 formula hugs and locks your foot in to place without the pain associated with other high performance shoes. An innovative concept of an active midsole rand that adapts to the foot’s shape while loading and unloading body weight to the forefoot, for the best power transmission. The Bi-TENSION system supports the arch and forefoot area without taking away sensitivity. Padded foam heel fit system developed by Boreal to hold the heel in place and avoid movement. A one-piece climbing sole that never deforms and has a superior fit. We can achieve different thicknesses in the rubber and the one piece construction avoids possible delamination. Permanent Power Platform rand system used in La Sportiva climbing shoes to maintain the downturned shape for the life of the shoe. Our related products actually relate to each other. We hand-pick each one. No joke, this all done be a real person because you deserve the absolute best gear database possible. We believe that relevant related products are just one small, but important, piece. We also collect all of the related resources for each product, like sizing charts, UIAA standards and PPE checklists. Basically all the paperwork the manufacturers have made about each piece of gear. At WeighMyRack we list every product there is -- even if we don’t know where you can buy it. But, if we do know where it’s sold, we’ll list that option. We’ve partnered with 30+ brands and retailers to bring you the most current pricing available. 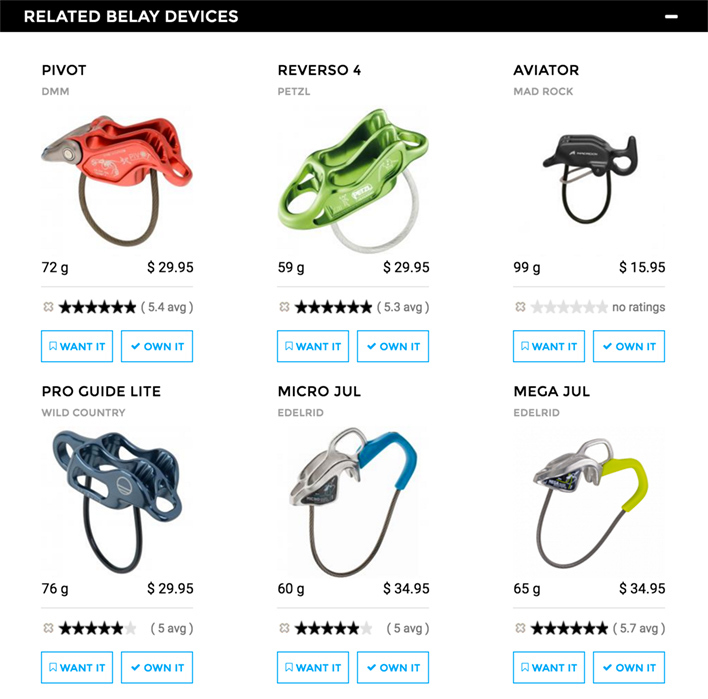 For example, these are the 14 buying options for the Petzl Sirocco. We’re not called WeighMyRack for nothing! Here, you can add quantities to the gear you own and we’ll automatically add up the total weight. We also take this calculation a little further: you can see exactly what percentage of your rack your helmet takes up (or any other piece of gear for that matter). This isn’t just your standard wishlist. Yes, we’ll save this list for you when you get back, BUT you can also sign up for email updates. This means you don’t have to keep refreshing the page waiting for your wanted gear to go on sale. Instead, you can get a custom sales alert. You can literally be climbing, while we’re working to find the sales. And, we’ll only send you an email if, you actually signed up to get sale emails from us, and the gear you want is over 10% off. The gear that WeighMyRack users want most. There are over 500 different climbing shoes out there. That many options means that you can basically get a custom shoe. You can take your performance to the next level when you’re confident in the features you’ll need to get you there. This guide goes over every shoe feature; it took us 2 weeks to write and it’s over 6200 words. We cover basics to the nitty gritty. Options like the type of closure, shoe material and last shape. We talk about gender and shoe volume and how they relate. We also give tips on how to nail the best fit. And, we even dive into the details of asymmetry and downturn--to help you find the perfect shoe. Really, most carabiners will get the job done just fine. But do you really want to settle with “fine”? If not, then this guide is for you. If you’re like us, you want the best. This guide covers the basics of gate types and keylock functionality but then dives further into really important (but not commonly discussed) factors like nose angle. Once you learn about the different features and how they relate to each other, you’re bound to have better clipping experiences. Watch videos of the newest gear before it’s released. Learn from the designers, engineers, pros, and brand reps as they nerd out on the latest products. Where to go ball nuts deep into the details of gear. We cover gear design, technical reviews, materials, and stories about gear via words, photos, and videos. Video, tons of photos, and the pros and cons of each shoe. Including the Five Ten Quantum, La Sportive Skwama and Otaki, Scarpa Drago, Tenaya Iati and more. Learn how to get stuck cams and nuts un-stuck. We go over tips and tricks to get more booty with your nut tool. Climbers are a picky bunch. Our recommendation is: Don’t buy gear. We may be huge gear fans at WeighMyRack BUT we believe gear is personal. Instead, we’ve come up with non-Gear suggestions that will help you dial in a gift that’s sure to please. Come to City of Rocks to get away from any kind of "city" feel. Enjoy a lack of cell phone service and campsites hidden among the boulders. Find details of where to eat, what gear to bring and campsite notes. Metolius pulled out all the stops and re-designed their Master cams to ensure they definitively deserve their full title: Ultralight Master Cams. Find out why Metolius won a 2016 Editors Choice Award from Climbing magazine for all their efforts updating their classic cam model. Almost every carabiner you use will be non-locking offset D’s, with the exception of Pear/HMS lockers. Yet, that’s just not satisfying for us, it doesn’t answer WHY each carabiner shape exists and how it’s intended to be used. A daily dose of the hottest racks available, provided by climbers like you.